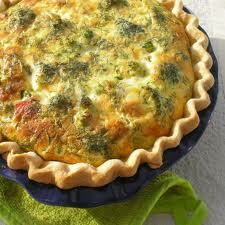 Thought I would post my yummy and healthy Broccoli Ham Quiche recipe. This is a great addition to your Easter brunch or breakfast potluck! This recipe makes 4 pie crusts. Form into 4 separate dough balls, Chill. Roll one ball out between wax paper to fit pie plate. Rolled dough balls can be frozen. Layer ham, cheese and broccoli, onion in crust-lined pan. In medium bowl, beat eggs and milk with fork. Pour over broccoli ham mixture.